Refinery CMS: There are currently three Rails based CMSs that I think are suitable for production use: Radiant, BrowserCMS and Refinery. Radiant is the grand-old man of Rails CMSs, but I never really fell in love with it. BrowserCMS looks like a really solid CMS with loads of features, especially features you would expect to find in commercial “enterprise” offerings. I find the interface to be quite complex, to the point where I think it will require training end users in its use, but I am sure it has its uses on larger CMS implementations. Refinery CMS is a fairly new Ruby on Rails CMS, that comes with a nice and clean interface and has the most basic functionality built-in, like image and file-upload. ThemeForest: They have some great HTML templates, and this is now the first place I go to to find a template for a new project. Themes cost around $10-20 and the fact they charge for them, means you won’t see them on thousands of other sites. Heroku: Probably the slickest Ruby cloud platform available today. Deployment basically comes down to pushing your code to a remote repository on Heroku. That’s it! Heroku is a fully managed platform, so you never see a shell prompt, and don’t need to worry about installing any part of the Ruby web stack. Refinery, ThemeForest and Heroku turned out to be a really potent mixture. Refinery helped me get a few pages of content up really quick and allowed me to easily add some custom functionality. The ThemeForest template solved was it often the biggest obstacle for a design-challenged developer: Making the site look professional. Heroku made deployment the simplest thing in world. I could have deployed to an existing server of mine with minimal effort, but that would have left me with one more application to babysit. As long as you plan on deploying to Heroku from the beginning by using PostgreSQL for development, Amazon S3 for file storage and make sure any gems or plugins are compatible with Heroku, you should have no difficulties getting your application deployed to Heroku. Last week Scrum.org launced a redesigned homepage. 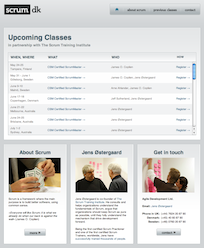 As part of the redesign I assisted with the development and customization of courses.scrum.org. Founded by Ken Schwaber, the co-creator of Scrum, and other leading international Agile experts, Scrum.org provides a complete solution for companies seeking high-impact results from Scrum and Agile development. One of the offerings by Scrum.org is the Professional Scrum Developer program. It is an interesting take on Scrum training—not for Scrum Masters or Product Owners, but for developers. You can read more about the launch on Scrum.org. 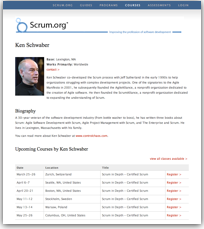 This week I launched a new site for The Scrum Training Institute at scrumtraininginstitute.com. If you’re getting started with Scrum or Agile these are the experts you want to learn from! 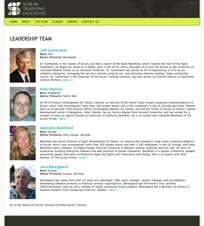 Currently their team consists of Jeff Sutherland (co-creator of Scrum), Jens Østergaard (a fellow dane), Gabrielle Benefield and Pete Deemer. The site is live now and we will be adding more features over the coming weeks, as I work my way through the backlog. My latest Radiant project is now live! I don’t usually work on “plain old websites”, but I had an itch to try out Radiant CMS, and so I decided to take a small gig building a showcase site for a real estate developer (or property developer, depending on which side of the pond you’re on). So far Radiant has been a pleasant experience and I’ll definitely use it for a couple of other sites. Initially my impression was that it had way too few features to be of any real use, but it has the 20% features that you use 80% of the time. For the rest there’s a bunch of extensions, some which are almost mandatory for any site, like the page_attachments extension, that enables file-uploads on all pages. Also, Radiant is based on Rails, so if you can’t find an extension with the functionality you need it can be easily extended. Working with Radiant also gave me a chance to look into Rails hosting options in Europe. Most of the dedicated Rails hosting companies have data centers in the US, so I needed to look elsewhere. I ended up hosting the site on a VPS from RimuHosting, who have a data center in London. They don’t specifically promote themselves as a Rails host, but they do have instructions for running Rails on their servers and they will install a complete Rails stack for you if you just ask when ordering the VPS. Setup was a amazingly fast even though it involved a real person handling my order. Within 15 minutes of submitting the order I had an email back saying they were working on my order and about 30 minutes later I was logging in to my new server! 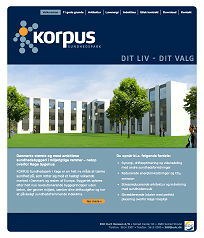 The site is live now at korpus-sundhedspark.dk (in Danish). Det er altid rart at se resultatet af ens arbejde og især som freelancer, da man ofte er ude af døren og videre til en ny kunde, inden projektet går i produktion. Det var derfor med stor glæde (og en smule spændt) at jeg så borger.dk gå i luften d. 3. januar. Der var ikke det store postyr omkring premieren, men den blev da alligevel nævnt af bl.a. Computerworld, ComON, Ekstra Bladet, Berlingske og B.T.. Læs pressemeddelelsen hos IT- og Telestyrelsen. 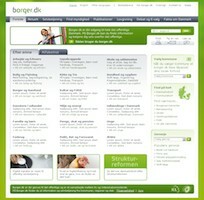 Fra i dag har danskerne fået en ny portal som samler offentlige digitale tjenester og informationer på tværs af stat, region og kommune. Den nye internet-tjeneste Borger.dk erstatter de gamle portaler netborger.dk og danmark.dk, der samtidig lukkes. Borger.dk kan blandt andet bruges til at melde flytning, beregne sin efterløn eller finde oplysninger om sin nye kommune. 3.000 brugere første dag og 180.000 sidevisninger. Og frem for alt en problemfri premieredag. Det er status efter borger.dk i går officielt gik i luften. Jeg har brugt en del af min tid på projektet med udvikling af integrationen til FOA, bl.a. visning af oplysninger om de 98 nye kommuner, der også integrerer med Krak og KMDs kommunefakta. Update: 3.000 brugere og 180.000 sidevisninger lød ikke helt rigtigt – 60 sider pr. bruger er nok lige i overkanten. De rigtige tal er knap 30.000 brugere og 180.000 sidevisninger. Desuden hørte jeg at kunden er glad for løsningen – rigtigt glad endda. producing useful or helpful results; constructive. Busy. Not currently available for hire.